The Jim Jones Leadership Award is an annual award given to an outstanding drum major nominated by his or her director and chosen based on his or her leadership both on the field and off. DCI Hall of Fame members select the award's recipients. The award has grown over the years and now includes monetary awards for first, second and third place drum majors, contributed by DCI Hall of Fame members. This year's recipient is Evan VanDoren of Carolina Crown. "It's been an unbelievable season," said VanDoren. "We've been through so much, and I've personally learned so much from all our administration, our faculty and our members." He attributes his success in leadership to the support he has received from the Crown family. "They have created who I am today and they have helped me to achieve this award. So I really don't think it's my award, it's really Carolina Crown's award. My thanks really goes out to the organization, because without them, I'd be sitting in the stands." Evan's father Donnie is a member of the DCI Hall of Fame, which makes the award particularly poignant. "Having a family with a drum corps history, there's certainly an expectation when you go into an activity like this," said Evan. "I'm just happy that I'm living up, hopefully, to what they expect of me." Mrs. VanDoren was quick to affirm that. "We're incredibly proud of him and of the organization that he's a part of," she commented after the award presentation at Saturday night's DCI World Championship Finals. Added Donnie VanDoren, "He's been around some incredible people, great mentors and great educators. We're really happy he's marching there." Evan will "age-out" in 2008. 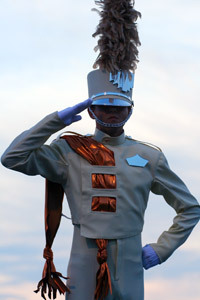 Jim Jones was a founding director of Drum Corps International and was founder and director of the Troopers of Casper, Wyo. He was the first director to bring his corps to perform at shows all around the country, thus setting the model for modern "touring" drum corps. Jones was a charter member of the DCI Hall of Fame in 1985. He passed away in 1994. The Jim Jones Leadership Award, established in his memory, was first given in 1997.